Interested in learning Foreign Language Courses in JNU? How to apply and get admission in Jawaharlal Nehru University? This ultimate guide will help you find all the relevant and important information about Eligibility Criteria, 2019 – 2020 Entrance Exam, Admission procedure, Syllabus, Sample and Previous year question Papers, List of Centres and Departments dedicated to foreign language study in JNU, List of courses, Fees, Important dates, etc. The online registration process for JNU Entrance Examination, 2019-20 will begin online from March 15, 2019. The registration process will close on 15th April, 2019. The entrance exam will be held from 27th to 30th May, 2019. Jawaharlal Nehru University is one of India’s top-ranked central university located in New Delhi, India. Established in 1969, JNU has been based on a campus spread over approximately 1000 acres of land on the Aravali range in New Delhi. JNU has over 7300 students, who come from all parts of the country and abroad, and from all sections of society. Despite the fact the admission procedure is quite difficult due to limited number of seats, pursuing Foreign Languages Courses in JNU is one of the most sought-after in the field of languages in India. It is probably the only central university in the country that is research-oriented, and not just doling out degrees. Despite the political controversies that often surround it, JNU seems to have survived the battering to its image, emerging as the best university of India. 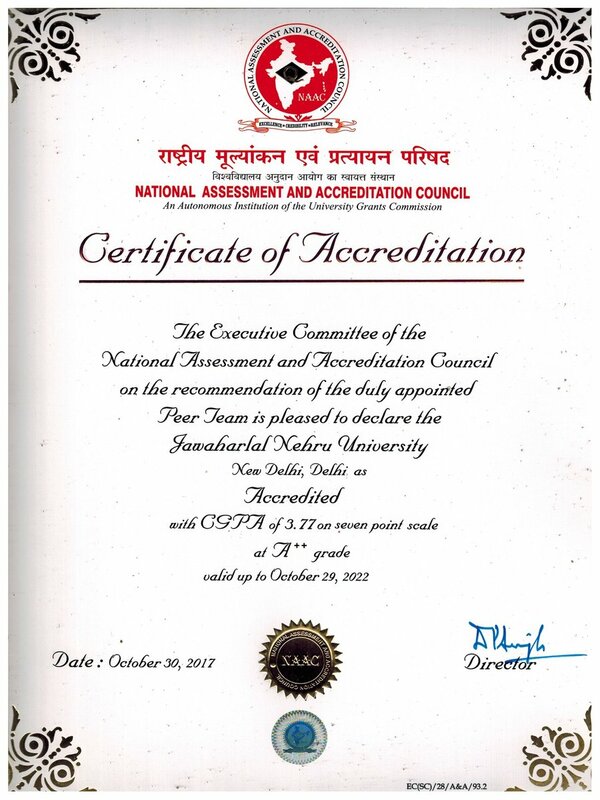 It has managed to get an A++ rank, the highest in the second cycle of the National Assessment and Accreditation Council (NAAC). Additionally, JNU is also among the best Universities in India as per NIRF (The National Institutional Ranking Framework). Established in 1969, JNU’s School of Language, Literature and Culture Studies (SLL&CS) with the core faculty of language and literature is directed solely to the study of linguistics, literature, and culture studies. It is not only the best university in India in the field of learning languages and pursuing higher studies and research in various languages but the only institution of its kind in India where facilities for teaching and research in most of the major foreign languages are available. Besides, the School also has a well-equipped Language Labs and Multimedia Complex (LLC). All the Centres of the School and the School itself have active international collaborations with leading universities of the world through AoC-s and MoU-s. They publish its own journal, Journal of the School of Languages (JSL), that publishes significant research on literatures, languages, culture studies, comparative studies, and translation that cut across language boundaries. SLL&CS produces the very best scholars in the fields of language teaching, linguistics, literature and culture studies, as well as internationally acclaimed translators and interpreters. If you are planning to take up learning any foreign languages in India, JNU is the best university in the country. Training in any one of the languages being offered by the School enables one, at the end of the training, to become a translator, interpreter, a teacher, employe in a corporate world or an intercultural consultant. In an era of globalisation, a person trained in a foreign language is always in demand thanks to a wide array of Career Options in Foreign Language. The different units of the School offer a variety of programmes in different languages. There are Certificate, Diploma, and Advanced Diploma of Proficiency programmes, BA, MA and MPhil/PhD programmes in various foreign languages like Arabic, Mandarin Chinese, French, German, Japanese, Korean, Persian, Russian, Spanish, Portuguese, Italian, Pashto, Bahasa, Mongolian, etc. Out of total twelve centres, SLL&CS has nine centres for different foreign language courses in JNU. The Centre of Arabic and African Studies (CAAS) has emerged as one of the most prominent centres among all the Indian Universities especially in the field of modern Arabic Language and specialisation in its literature, translation and interpretation. If you’re interested in pursuing Arabic Language Course in Delhi, JNU is the best choice. One of the reasons why most Indians are learning the Arabic language in India is to enable them get jobs in the Middle East or in other parts of the Arab world. The Centre of Arabic & African Studies (CAAS) offers BA (H), MA and five-year M.Phil/ PhD programmes in Arabic Language, Literature and Culture. The centre also offers optional courses in Hebrew and African Swahili language. Given India’s growing ties with Israel and rising demand and job prospect, JNU has already started Certificate and Diploma in Hebrew Language. Over the years, Centre for Chinese and South-East Asian Studies (CCSEAS) has grown into one of the largest Centres of the SLL&CS in JNU. BA (Hons. ), MA, M.Phil and Ph.D. programmes in Chinese Language, Literature and Culture Studies at the CCSEAS Centre have been attracting and inspiring both the Indian and foreign students for over four decades. JNU is the only option if you’re interested in pursuing Degree level Mandarin Chinese Course in Delhi or North India. Thanks to the rising Job Opportunities in Chinese Language, The Centre offers an intensive specialized training in modern Chinese language with particular emphasis on the commonly spoken language (putonghua or Mandarin) in present day China. They also offer Certificate of Proficiency (COP) and Diploma of Proficiency (DOP) in Bahasa Indonesia Language in Delhi campus. The Centre for French and Francophone Studies (CFFS) is actively engaged in teaching and research in French and Francophone Studies. The CFFS offers full-time courses at the level of B.A. (Hons. ), M.A., and M.Phil/Ph.D. in French language. JNU is the first University in India to create a Centre of French and Francophone Studies. Why Learn French? While there are numerous benefits of learning French in India. The main attraction are Career Scope and Job Opportunities in French Language. At the MA level, students may specialize in French & Francophone Literature or Translation & Interpretation. Courses on language, linguistics methodology of teaching French as a foreign language and civilization (History of Art, Cinema, French thought and Mass Media) are common to both streams. Established in 1971, The Centre of German Studies (CGS) is among the first departments to offer separate degrees in Literature, Translation, and Translation/Interpretation. They offer B.A. (Hons), M.A., M Phil and PhD Program in German. Occasionally, Centre of German Studies also offer part-time or elective Dutch language course. Recent years have seen intensified collaborations and academic cooperation with universities in Germany and Austria. We have student and faculty exchanges with, amongst others, the Universities of Köln and Wuppertal, the Freie Universität, Berlin, and the University of Konstanz in Germany. Centre for Japanese Studies (CJS) is one of the centres of excellence in the South Asia, where the programs ranging from Bachelor Program to Doctorate level Ph.D. are offered. The courses are designed to acquire not only the language skills but also impart basic knowledge about the history of Japanese literature, culture, history, society etc. Postgraduate courses as well as M.Phil and Ph.D. programme in the centre envisage students to pursue higher level of expertise, using Japanese Language as a tool in the areas of Japanese Literature, Culture, Linguistics, Translation and Interpretation. CJS is offering a 4-semester optional course in Japanese to the B.A. students of the other Centres of the School as well as M.Phil / Ph.D. students of Japanese Studies in CEAS and SIS. The Centre for Korean Studies (CKS) is one of the biggest academic centres of Korean Language, Literature and Culture Studies in Indian Subcontinent. It offers B.A., M.A., M.Phil and Ph.D. programmes in Korean Language, Literature and Culture Studies. The Centre for Korean Studies (CKS) also offers a part-time Certificate of Proficiency and Diploma of Proficiency in the Mongolian Language in Delhi campus. The Centre of Persian and Central Asian Studies (CPCAS) has emerged as a prominent seat of Modern Persian Studies all over India. Besides Modern Persian Studies, it also excels in Translations, Area Studies of Iran, Afghanistan, Tajikistan, Uzbekistan; Indo-Iran Relations; Ancient Iranian Studies, History of Persian Language and Literature and Stylistics in Modern Persian Literature. The Centre of Persian & African Studies (CAAS) offers B.A. (Hons. ), M.A., M.Phil, Ph.D. programmes in Persian and Central Asian Studies, which cover the entire gamut of language, literature and culture of Iran; Afghanistan, Tajikistan and Turkey. The centre also offers Certificate of Proficiency in Pashto, B.A. (Hons.) and MA in Pashto and Optional Courses of Turkish Language are being taught here with professional skill and scientific methods. Read — Persian Classes in Delhi and Why Learn Persian Language? Since its establishment in 1965 almost five decades ago, it continues to be the leading Centre for learning Russian Language, Literature & Culture in India. It is the oldest Centre of Jawaharlal Nehru University. The Centre of Russian Studies (CRS) offers UG and PG Courses well as M.Phil & Ph.D research programmes. It is well-known Centre for the study of Russian language, literature and culture in India. It promotes area specific as well as interdisciplinary research activities in the field of Russian Language, Literature, Culture and Translation Studies. The Centre since its inception has been playing an important role in developing good relations between the two countries and has produced a large number of qualified language interpreters and translators. Read — Russian Course in Delhi and Why Learn Russian in India? Centre of Spanish, Portuguese, Italian and Latin American Studies (CSPILAS) is innovative with regard to its academic structure. CSPILAS has a full time five year integrated M.A. programme in Spanish. Students have the option of a BA (Hons.) degree at the end of the 6th semester (3rd year). The Centre has two separate research programmes: M.Phil and Ph.D. degree in Spanish / Hispanic. Why Learn Spanish of all the languages? There are huge advantages of Spanish Language. The primary reason is jobs for Spanish speakers in India. If you’re interested in Learning Portuguese in India, Then centre also offers courses in Luso-Brazilian Studies. Several students have completed M.Phil in Portuguese with their research on topics related to Brazilian literature and culture. The centre has been running part time programme in Italian language at the level of Certificate and Diploma as per the availability of the faculty. School of Language, Literature & Culture Studies has three more centres, namely 10) Centre of English Studies (CES) 11) Centre for Linguistics (CL), and 12) Centre for Indian Languages (CIL). How to get admission in JNU for foreign language courses? Candidates who want to appear for the entrance exam should have completed 10+2 with minimum 45% or who are due to appear. Currently, JNU offers admission in the first year of Bachelor of Arts (B.A.) – The 10 different languages divided in 3 clusters. Candidates may opt for three Languages from two clusters or three languages from within the same cluster. The entrance test for this programme is a common test which will be conducted along with the B.A entrance test for 3 Clusters mentioned above. Questions pertaining to general knowledge, artificial language, language aptitude and general English would be covered in the syllabus. The entrance test will be conducted in the English language as a Computer Based Test (CBT). Entrance exam of Certificate of Proficiency in Bahasa Indonesia is conducted as a joint test with other part time programme; Hebrew, Urdu, Pashto and Mongolian. The eligibility criteria is 10+2. The written examination is conducted in English and is of total 70 marks. The syllabus covers – 1. General Knowledge; 2. GK of the country of the languages; 3. Aptitude test and General English. Entrance Examination for M.A. and M.Phil. in the concerned language shall be conducted in the same language. In addition, Admission to Ph.D. Programme is also offered in the most of these Centres. B.A.(Hons.) in foreign language (except Pashto) being an integral part of the 5-year M.A. programme, on successful completion of B.A. (Hons. ), the student will be eligible to seek registration to the first year of the M.A. programme (i.e. fourth year of 5-year M.A.) in the respective language, without having to go through the entrance examination. No. of seats for B.A. (Hons.) 1st year (As of March, 2019): French – 48, German – 48, Russian – 68, Spanish – 39, Japanese – 48, Korean – 39, Chinese – 44, Persian – 39, Pashto – 19, and Arabic – 39. No. of seats for MA (As of March, 2019): French – 19, German – 29 (Literature – 10 and Translation – 19), Russian – 10, Spanish – 08, Japanese – 08, Korean – 05, Chinese – 04, Persian – 19, Pashto – 06, and Arabic – 10. The total number of seats for M.Phil and PhD are not fixed, check the prospectus for more details. In two words – Almost Free! JNU Admission form, Hostel Fees, yearly Tuition fees, Library and other miscellaneous fees are negligible. JNU is funded by Central Government. This means that the students from the poorest of the poor backgrounds can come and study in JNU. Want to study in a sprawling campus of over a 1000 acres with all the facilities, lively campus life, and under highly qualified faculty that also almost FREE? Well, there is a reason why Foreign Language courses in JNU is considered as the BEST in field of Foreign Languages in India. I want to apply for MA in French. I have done graduation under 10+2+4 pattern. Am I eligible to apply? Yes but to clear the entrance test, you need French knowledge equivalent to 3-year BA or Advanced Diploma in French or DELF B2. In short, MA in French is meant for those who are already very good in French language since MA covers literature, history, translation, culture and civilization. Sir right now I am doing Masters in English. I want to do some certificate or diploma course that adds to to my skill because I want to be a professor in future. So suggest me something related to that. If you want to be a professor in English, you need Ph.D. in English with some good experience in the same field. While any Certificate / Diploma course can be an added advantage, it won’t make a significant difference on your C.V.
Sir ,I want to study in JNU ba foreign language but last date was 15 April and today is 16 april. Sir,tell me about any chance to fill the form after last date or any late admission fee? Good news for you. JNU has extended the deadline for admissions by three days. Now Last date is April 18, 2019. Sir I have completed my graduation with physics honors. And i have interested in language courses please tell me about French, German, and Turkish. Which courses are better for me? Well, only you can decide. There is No One-Language-Suits-All Solution. Read more and i’m sure at the end you’ll able to pick the right language and course. For references — Scope of German Language, Reasons to Learn French, Benefits of Learning Turkish, Which Language to Learn? and Foreign Language Courses. For How many marks JNUEE B.A. in foreign languages conducted and what would the expected cutoff for general category? It will be 100 marks exam. There is no such thing as cut-off in the entrance test. The top scorer in the respective categories will be eligible for admission. Is there any negative marking in JNUEE B.A. in foreign language? There will be no negative marking according to the prospectus. I’m learning Chinese language but I want to do graduation with this language but I’m pursuing BA final year so I want to join with the chinese from 1st year hons so is this possible or not? I am confused about the negative marking scheme in entrance exam for foreign language. And also besides jnu previous year book what should I read to enhance my general knowledge and aptitude. Please suggest. Where you have read the negative marking for bachelor entrance test? GK and language aptitude are very generic subject. You can refer any Good book. I don’t have any particular suggestion. Sir, what are the future career in doing bachelor degree in language course? What may be the earning? The salary depends on multiple factors like choice of language, proficiency level, company profile, nature of the work, location and many more. Thus, it is very difficult to give you an estimate how much you’ll earn. After bachelor program, i would suggest to pursue MA in the same language. After master degree, you will be eligible for plenty of high-paying language jobs. You can contact JNU admission department or call for details. This blog only covers foreign languages. So, difficult to say about other courses. sir, i have completed my ug in bE civil so i’m interested in learning foreign languages. Sir can i study now after my BE civil what steps i should take to do this. Is that benefit for me doing foreign diploma courses with BE civil. Please guide me. Yes, anyone can learn any language at anytime. Language is useful in a variety of businesses and jobs. There are three broad steps (i) Choose a language of your choice. Read —Which Language to Learn? and Top 10 Foreign Languages in India (ii) Short-list Foreign Language Course as per location, duration and affordability. (iii) Take the admission and embark the journey of language acquisition. Sir I have passed 12th but I have not studied French in 12th. Can i apply? and in the eligibility section there is a Certificate of alimiah is also required other than Senior school certificate. What is that? For Bachelor program in French, you don’t need any prior knowledge in French. JNU accepts both certificate of Alimiah and 12th. You need only one. Sir do we have to prepare for viva also for JNUEE Or is there only written test in it? And whatever cluster we choose, can we choose our choice of language it we got pass? Only written test as no viva voce examination is held for admission to any programme except for M.Phil and Ph.D. You can choose the language as per marks obtained in the written test, ranking and seat availability. Sir any information for 2nd year entry in BA Spanish at JNU? This year, JNU is not offering lateral entry to 2nd year. Sir, there will be two exam for B.A. in foreign languages if I choose languages from two different cluster? What will be the JNUEE for B.A. pattern on computer based? My guess is there will be exam for only 1 cluster though i’m not sure since it is not mentioned in the prospectus. You can choose the language of your choice and at the end, JNU will know through Admit card. The question pattern will be MCQ ((Multiple Choice Question). Thus focus on acquiring the ‘objective’ facts. You can check the syllabus on page no 154 of JNU e-prospectus. Sir i passed my 12th. And if i’ll fill my preference in JNU like Chinese, Japanese and Spanish then which cluster’s exam will i have to give means cluster-1 (French,Russian, German, Spanish) or cluster-2 (Chinese, Japanese, Korean)? My guess is cluster-2 though i’m not sure since it is not mentioned anywhere in the prospectus. You can contact JNU admission dept for the same. Sir, I will appear for 12th board this year for session 2019-20. So can I give the entrance exam next year before result. Yes. The students awaiting 12th results can also apply. Sir I am really interested in learning French. I recently completed my class 12th. I don’t have much knowledge about course and all. Will you help me for that? My aim is to work in French embassy and I really passionate about it. would please help me to know about the course or college. Either I should join alliance Francaise or jnu? Please help me. I have done 10+2 in 2017. After that I have taken 2 years gap. Am I eligible for BA in German? Yes, you are eligible. In addition, there is no age limit for studying in JNU. Sir, what syllabus come in JNU BA entrance exam. Can you tell ? I am currently living in Mumbai. I want to study in JNU but wont able to live in hostel due to personal issues. I just want some help in finding colleges for in Mumbai for BA in foreign language Or JNU takes correspondence students? I am from Kolkata and working here too. I want to learn Spanish. Is there any good institute in Kolkata for Spanish learning? I learn Spanish by my own but i want to enroll in certification course. Please suggest. The Kolkata University, Jadavpur University, Rabindra Bharati University, Ramakrishna Mission School of Language and Cd’A Global offer a variety of Spanish courses. Read – Spanish Language Courses in Kolkata. Sir what is the probability based on previous years that when will the entrance exam of Asian language for BA 1st year happen because on 27 and 30 both days I have exam of bcom (SOL). For East Asian languages, BA entrance exam will take place at 9:30-12:30 on 29th May. The entire schedule has already been declared by JNU. Is JNU giving the facility to appear in the 2nd year entrance examination for foreign language courses? Sir, is JNU giving the facility to appear in the 2nd year entrance examination for foreign language courses? No. As per 2019-20 E-Prospectus, JNU has removed the admission to BA 2nd year lateral entry. This is Shashank from Gurgaon and presently I am working in USA Based Company in Automotive field and Handling Export Market but I have interest to learn French or German language to advance my career, Therefore can you suggest is there any Universities in Delhi which offer part time language courses on Saturday & Sunday. So that I can learn on weekend. Most of the Colleges conduct part-time classes on weekday only (Morning or Evening). You can join any reputed private institute to pursue French or German course on weekend. Read — French Institute in Delhi, German Classes in Delhi and What foreign language to Learn? Sir, I was studying CA but now I’m thinking to leave it as my reason was only good package and better future but my passion is Languages, culture etc. So I’m thinking to give entrance in JNU for Japanese but what if I don’t get selected? So is there any other universities where I can apply too? I cannot afford to pay expensive fees and other charges since i belong to a poor family. What are the other options? Besides JNU, you can also try for DU, Mumbai University, BHU, JMI, etc. Most of the Government Universities are quite affordable. It will also depend on the course and location you’re interested in. For instance, BA in Japanese is offered by JNU, BHU, Visva Bharati University but not available in DU, Jamia, Mumbai University, Pune University, etc. Sir,Is the date of entrance exam still not announced yet? Sir, I have completed 12th std in 2018. Now I want to join for BA German in JNU. I wanna know more about the entrance exam, last date of application etc. You can apply when online application form will be released in March. The JNUEE would be conducted in May, 2019. Sir I have completed Bachelor of computer application this year, but now not interested to do MCA. Eager to learn foreign language, can you suggest what should I do now? Should learn from scratch (BA in foreign language) or any diploma course. What are the scope to learn foreign language, being a computer student? BA is not necessary, you can join any reputed institute with a goal to achieve advanced proficiency in 3 years. Choose a language wisely and enroll in any good learning centre! Read few articles to get some idea about which language and career scope. Which language should i learn, Best Foreign Languages for Career, Top Foreign Language Jobs, Career Scope in Foreign Languages. Hello Sir, Is it possible to do B.A. from JNU and take Classes from MOSAI simultaneously for better knowledge? While you can take weekend classes at Mosai but you don’t need that if you’re already doing BA in Japanese from JNU. The University offers full-time intensive course! Hello Sir, i’ve completed my BA with English as my major but i want to learn Korean now. so is there any chance for me to directly do MA in korean language from JNU? NO! For MA in Korean from JNU or any University, you need prior knowledge equivalent to 3-year BA / Advanced Diploma / TOPIK Level IV/V in Korean. The entrance question paper will be in Korean only. Sir, i have done certificate in Russian from Russian culture centre. so now i am interested to take admission in MA Russian. so it is possible to take admission in MA with certificate course. please let me know. Sir I am also like you, who always eager to learn a foreign language. Right now I pursuing my Bachelor’s Degree in Science along with my Certificate Course in Spanish Language from Rajasthan University. After all this can I able to crack the entrance test of JNU, or I opt to study something else. I’m glad you’re interested in learning languages 🙂 For BA, you don’t need prior knowledge of Spanish. If your target is MA in Spanish – You need knowledge equivalent to at least 3 year Advanced Diploma. Since certificate is not enough, you should continue learning Spanish for another 2 years. Is it possible to do B.com (H) from DU and BA German from JNU simultaneously? Sir now what’s the date for entrance. And what books you suggest for French language entrance exam ? The entrance exam will be held in May. The exact dates will be announced shortly. You can try any book that covers the JNU entrance syllabus and previous year question paper. JNU might make some changes since exam format will change to MCQ from this year. Sir i have graduated from du in bcom regular and now i want to make my career in french in travel and tourism. So sir what should i do? A part time certificate in french will be enough or i should do it from du or ignou? Sir if a student is choosing two languages from different clusters is he/she has to appear for two exams? No. There will be only one common test. The exam format might change a little from this year. Wait for the 2019-2020 eProspectus! Hello respected sir, i wanted to ask that are there any options for turkish language. İ want to study turkish from jnu as i saw that turkish as an optional language is available there. But will there be any degree given in turkish. And what about the mevlana or other scholarships that turkey offers to students studying turkish? Hi Sir. I am appearing 12th exam at the moment, and after that I want to study Japanese language in JNU. I don’t quite understand the syllabus regarding the foreign language subject. So, if you would kindly briefly explain it here, I’d appreciate it. And also, is the application form not out yet, Sir? The online registration process for 2019-20 Entrance will begin from March 15. This time, the exam format will be MCQ. The JNU entrance syllabus for last year included GK, artificial language, short essays on issues related to the subject, knowledge about countries as per cluster (Japan, China, Korea for BA in Japanese). You can check the e-prospectus and syllabus from tomorrow. If the questions will be MCQ this time, then the essay won’t be ask, Sir? Hello Sir, Which is better place to learn Japanese in New Delhi DU/JNU or MOSAI? I already replied to you. You can try for 5 year (BA and MA) from JNU. If you do not manage to get through the JNU entrance, go with 3-year part-time course from MOSAI. Third option is 3-year part-time Advanced Diploma from Daulat Ram or Ramjas College or 2-year full-time PG Advanced Diploma in Japanese from DU’s Arts faculty. When is the registration starting for BA Honours in french in JNU? thankyou so much sir . sir, i am in last year b.com by sol. I wanna to learn German. Should i do BA or possible to do since i am in commerce field. Sir, i have so many quarries regarding the course. Only BA in German is possible for you. You can try for the entrance exam to be conducted in May. If you’re selected, you can drop B.Com since Major from JNU is much more worth. When are BA Spanish hons online forms releasing for 2019-20? It is already mentioned at the bottom of the article. The application form to apply for all the language courses will be released in February. Since you are in 1st year, it is better to try for JNU. The BA Entrance exam will be held in May. Getting admission to MA in Japanese is quite difficult due to limited number of seats and requirement of higher proficiency in Japanese. Sir i am preparing for JNU cee. I want to know that while preparing for the test what should i focus more on, the language part or the other part? And if it’s the language part what to study for the particular language? Its history, facts, or other things? Please guide sir. Unfortunately, there is no guideline about that. You can cover GK, English and information (current and history) regarding the country concerned as per your choice of cluster. JNU is yet to publish the prospectus for 2019 entrance test. Additionally, this time test will be MCQ. Thus, concentrate more on facts and points rather essay writing skills. Choose one since you cannot do both the languages at the same time. JNU offers 5 year Integrated BA + MA in French or German. When the JNU forms will be released, it will updated here. All the information are there in this article. Sir I had completed 10th after then polytechnic (equivalent to 12) then I’m pursuing btech. I’m not having 12. So I’m eligible for enrolling in entrance test of JNU for language course? According to JNU prospectus, (10+2) or equivalent with minimum of 45% marks are eligible to apply for BA courses. If polytechnic are equivalent to 12th, then you can definitely apply. Do confirm from JNU admission department once form will be available. I have completed my bcom and I want to do language course from JNU. Can you please tell me sir what I have to do for this. Which Language and what kind of course you’re interested in? JNU does not offer any short-term courses and admission for BA is through entrance exam. Without prior knowledge, MA is not possible. All details are there in this article. I have completed my B.Tech in 2015. Now I am interested in learning German. Can I apply in JNU for BA Hons? Is there any upper age limit? I am 25 years old. Please, guide me Sir. Sir is it possible for a graduate also to get admission in JNU for language course? Yes but you have to repeat the graduation. JNU offers BA in 10 different foreign languages. Without prior knowledge, MA is not possible. Does JNU offer a certificate course or a beginners course in Spanish as i would like to do a short time course to see how i adapt to this new language?? What’s the admission process for such a course? Sir I am currently doing BA second year from Sol DU but I want to do foreign Language course from JNU So can I register in 2019 can I do both at the same time? Getting admission in JNU is not that easy. Admission is through entrance exam. If you clear the entrance, continue with JNU only since it won’t be possible to continue BA from SOL. Sir I am complete my graduation from sol DU. How to take admission in Spanish. My English is weak. Please reply me. Hello sir, I want to do language course in jnu so what is the process of admission? JNU only offers degree level BA, MA, etc. courses in various language through entrance exam. From 2019 onward, Admission will be done through Multiple Choice Questions (MCQs) based test. The entrance exam will take place in May, 2019 and application forms will be available in early 2019. Hello Sir, i did BA Hons. In Spanish from JNU in 2000. However i dropped out and did not continue MA. I would now like to pursue my studies further. Could you please advise what could be the possible course of action in this regard. many thanks! Sir, What is the admission process for language courses in JNU? Choose the language. Apply Online when forms will be available as per your eligibility criteria and then appear for the MCQ entrance exam in May, 2019. Sir i do want to do spanish in JNU. Will you please guide me how to take admission and prepare for the entrance?? You can apply online for BA in Spanish once form will be available in next few weeks. Entrance exam will take place in May. The entrance question paper will be of objective type within the broad framework of GK, English, logical reasoning, language aptitude, reading comprehension and beginners knowledge of the culture and civilisation of the language concerned / cluster opted. Without prior knowledge, MA is not possible. I completed my graduation with PCM in 2018 and interested in learning Japanese Language. But confused in selecting a good university. Should i go for DU or JNU? and Is learning Japanese a good choice for better future? Sir, I am a final year Bsc Physics student from Kerala. I wish to switch on to Persian studies. I have an average proficiency in Urdu language. Can you please guide me. You don’t need fluency in URDU to pursue Persian Courses. As per your situation, there is only one possibility — BA in Persian since MA is not possible without prior knowledge in Persian. Repeating graduation may not be the right thing to do. If you’re keen to study Persian, you can study from anywhere. There are plenty of options. Read — Why Learn Persian in India? Sir,I recently checked JNU’s official website and they say that the minimum age limit for BA hons. in foreign language is 17 years old. the thing is i am 16 years old can i give the entrance exam? That was for last year. This year, JNU has not yet released the prospectus for 2019-2020. Wait for confirmation. Even if they follow the same eligibility criteria like last year, it will be “Minimum age : 17 years as on 1st October 2019”. Sir how can I contact u regarding language courses. I would like to do my BA in one of foreign languages in jnu but confused which one to choose my primary concern is the high salary and demand for the language whether it is European or Asian language. Which one to choose help me sir. sir the exam pattern of JNU consists only MCQ type questions or there will be writing part also like writing essays and rearrange sentences ? Full details of the MCQ test have yet to be announced by JNU. Hopefully very soon. I passed out my class 12 (2018) and now i am doing my BA 1st year but I am interested in learning foreign language. so I wanted to know if it is good to start all over again and for the admission do I have to wait for this coming 2019? JNU has announced a delay in the JNU Entrance Exam for the academic year 2019-2020 due to the change in the exam mode. This time, It will be computer based test. Registration forms will be available soon and entrance exam might take place early 2019. Getting admission in JNU is not an easy task. Start preparing for BA 1st year as per the cluster and if you pass the entrance, take the admission. JNU is ranked number one for foreign language courses. Hello Sir this is Debarati speaking. Sir I am currently studying in class 12 and my board exams are going to be held in 2019 February or March. I am willing to study spanish language course at JNU, so will I have to wait till next academic year to get admitted only after acquiring my 10+2 certificate or am I able apply for it before. If so I would be grateful to you for helping me with the method. You can apply. The candidates who are due to appear in 10+2 in early 2019 are eligible to apply. Sir, i am under 17 can i give the entrance exam at JNU (BA hons in foreign language)? Yes provided that you are in 12th or already completed 10+2 or equivalent with minimum of 45% marks. Hello sir, what about the hebrew language in certificate course? When is the application date?? If i’m not wrong i thought i saw the application forms was to be done by 13 of Oct but for some other reasons i couldn’t do it, so is it still possible for me to give the entrance for language? i am a malayalee student (kerala) but i don’t know about jnu entrance exams and many things you please give me any advice for confidence to me. If you don’t have any prior knowledge in the language of your choice, then BA (Hons.) is the only option. Check the syllabus (LINK) and Previous year question papers (LINK) and start prepearing with the help of few books. The registration process is yet to start and maybe this time exam is expected to conduct in online mode. Please suggest me the Guide Book for entrance exam for BA Hons in Ist year in French Language. Can you please provide any type of help for preparing the same exam. I don’t have any particular recommendation. You can try few books available at bookstore or Amazon/Flipkart. please guide to me for entrance exam for BA Hons 1st year in french language. can you please provide any type of help for preparing the exam. You can check the Syllabus (LINK) and previous year Question papers (LINK) for BA (Hons) in French. You can also buy few books to prepare for the same. I am a student of 12 of cbse in 2019. I want to do BA Hons in French Languages from JNU please help me. You can apply once the registration will start. You can start preparing for the entrance exam. Check the syllabus and previous year question papers. Everything is there in this article. My Name is Nitish. Sir i want to learn Russian language from “JNU”. And i have already completed my Graduation from University of Delhi B.A(Hons) English. So, Sir please let me know that what should i do to learn this language in “JNU”. I will be very thankful to you. BA (H) in Russian is the only option for you if you’re ok in repeating bachelor program. JNU does not offer any part-time or short-term courses in in any language and MA in Russian is not possible since knowledge equivalent to BA / Advanced Diploma in Russian is mandatory to pass the entrance exam. Sir I am pursuing one year diploma in Spanish, can I get admission in BA Hons Spanish (2nd year) in JNU. am I eligible for it? If you have already completed or pursuing 1st year bachelor degree, then Yes you are eligible to apply. Entrance exam will be held in December. Check the Syllabus and previous year question papers. Sir I’m doing my equivalent paper from ignou this year. So is their any possibility to get admission in jnu for 2019 season? Sorry, I didn’t understand you. What course you are pursuing from IGNOU and you’re interested to apply for which course from JNU? Sir besides the previous question papers which study material should I study for BA entrance exam for chinese, japnese, Korean language? Buy few books for entrance exam in Languages. For East Asian Language cluster – GK, artificial language, short essays, and study about culture, geography, prominent personality, customs, art, history, literature, etc of China, Korea and Japan. For BA (2nd year), Knowledge equivalent to Diploma is required. Check Syllabus & Previous year QPs to get the idea. Sir I want to give entrance exam for foreign language. When the date published of foreign language? Dates yet to be confirmed by JNU. I’m doing advanced diploma in german from Delhi University. I want to do MA(translation) in german from JNU. Could I please know the syllabus and the format of the entrance test? I really want to prepare for the same. And when shall I apply for the same? Check Syllabus for MA in German. (LINK), Previous Year Question Paper (2017 – LINK), (2016 – LINK), (2015 – LINK). Official notifications for 2019 still not released. May be in next few days. Sir, what does BA (Hons) in Foreign Language actually mean? Does it mean Bachelor of Arts or Bachelor of Foreign Language? Will language be the main subject? Yes. It means BA in the corresponding language. If you choose BA (Hons.) in French, most subjects will be related to French language and literature. I want to know that commencement of online form filling date for BA (Foreign Language) of JNU. JNU 2019 Registrations will start very soon. Dates not yet announced. Is jnu stopping the entrance examination of 2nd year from this year for foreign language course? I’m not aware about it. If there will be any information, will update here. Official details for 2019 admission has not been announced yet. As soon as JNU will release the dates, will update here. Sir can I do MA in Chinese language from JNU after doing certificate, diploma and advanced diploma in Chinese from DU or I have to first take admission in JNU for BA in Chinese and then only I can do MA? please reply me. For MA in Chinese from JNU, you need bachelor degree and knowledge equivalent to advanced diploma since admission is through entrance exam. So, Yes Advanced Diploma in Chinese from DU is fine. Sir recently i pass out my 12…i want to learn spanish so plz suggest me which is the best course for learning spanish. Sir, I’m learning Spanish from bhartiya Vidya bhawan and I think the language department of bvb affiliated from jnu. I just want to know I have completed 2 semester and pursuing 3rd and I want to get admission in jnu so what can I do to get admission? No. BVB has no affiliation to JNU. MA in Spanish is not possible for you. Once you complete 6 semester in Spanish and graduation, then possible. Try either BA (1st year) or BA (2nd Year) in Spanish. Yes sir I know MA in Spanish is not possible but I wanna apply for BA(1year). so is that possible now? Yes. Prepare to crack the entrance exam in December. Prior knowledge in Spanish is not required. I’m very confused like what to do to make a good career. I did Bachelor in English literature (DU) and correspondence MBA in Marketing (Amity university). Someone told me you will get best packages if I’ll do some other foreign language. I want to go for Japanese language, sir please tell me is it worth for me to go for BA again. Hello Sir, my name is Azhar. I have done b.tech (2012). I am interested to learn Spanish. Am i eligible to give an entrance exam? Hello sir, I want to do MA in French from JNU, I have diploma in French from St. Stephens (DU) and also have the knowledge of Advance diploma but due to some personal reason I didn’t clear advance diploma exam. So I want to know am I eligible for Masters or is it compulsory to have certificate in advance diploma. Please let me know. For MA in French, Only eligibility criteria is bachelor degree. You don’t need advanced diploma or even certificate in French. However, Knowledge of French equivalent to Advanced Diploma or DELF B2 is compulsory to clear the entrance exam. You can check syllabus and last few years question papers to judge yourself. Sir i m from bihar nd i m pursuing graduation 2nd year from here sir i wanna do a course in any foreign language where i got better scope in future. what is the procedure. Kindly give me information about that. All languages are important though Top 5, namely French, Spanish, German, Japanese, and Mandarin offers better career opportunities. You can apply for BA (Hons.) 1st year entrance exam. For 2nd year entrance, Prior knowledge in the corresponding language is required. It will difficult to achieve that level of proficiency in 3-4 months. Syllabus, Dates, Admission procedure are mentioned in this article. Read – Foreign Language Courses in Delhi and Which Foreign Language to Study? I have completed my BA and MA in linguistics from University of Dhaka and Diploma in french from Institute of modern languages from the same university. I want to further study french in JNU. Please tell me what to do and from where should I start? Salut Sabrina! What is your Nationality and Where are you currently residing? I guess you are not Indian. JNU Offers BA, MA, and M.Phil/Ph.D in French. I checked Dhaka University and 1 year Diploma in French is not enough to clear the entrance for MA in French. BA won’t be the right thing to do and you might not be eligible for Ph.D. in French. If your French is good, You can still try MA in French (depends on your French knowledge). If you are in India, you can apply online like anyone else otherwise there is also an option to apply from outside India (In that case, you’ve to select “in absentia” category for which separate application form is available). Admission procedure is going to start in two weeks. If you want to pursue French or any other course from India, there are several good options. You can mail me if any query. I’ll be glad to help you. Bonne Chance! Merci beaucoup Monsieur ! I live in Dhaka. MA in French will be difficult for me. To be honest, I have completed my B1 in French, and my pronunciation is quite good, but I still have lacking in fluent speaking and listening. So If it possible I want to start from BA 2nd year. And here to mention I have a linguistics major. I really look forward to hearing from you about the procedures. Forms will be available from 15th September. You can apply online. Since no. of seats for BA 2nd year is very few. Thus, you need to prepare quite well. Let me know, if any query. I wanted to ask what kind of degree one gets after getting into and completion of B.A(H) 2nd yr for any foreign language. Is it like a normal 3 year degree or there is a different one for someone who has applied for the 2nd year one. After 3 years, You will get BA (Hons.) in the corresponding language irrespective of whether you took the admission in 1st or 2nd year. Only those who completed 1st year can take admission in 2nd year (provided that entrance exam is cleared). sir, i am doing CP2 i.e. 2nd year in Chinese from Delhi university (part time) and i want to take admission in JNU for my further studies in chinese. which course should i apply for? I guess you just started Diploma in Chinese. If you’ve already completed or pursuing 1st year bachelor degree, then BA (H) in Chinese 2nd Year entrance exam. Mind you, you have to really work hard on Mandarin not because question paper will be difficult but due to limited seats (5-10). BA (1st year) if you are either not doing graduation or not a graduate. Sir I am learning Arabic (cop) level from school of foreign languages this year. Can I take BA 2nd year exam or should I take BA 1st year entrance exam held in 2018 December? Interested in BA? 2nd year is not possible since entrance paper will be in Spanish and 4 months is not enough to reach that level. You can apply for BA in Spanish (1st year). Apply and prepare. All details are there in this article. Does there any criteria in jnu that if one student can not qualify in the 2nd year entrance examination in foreign language can get a chance to direct admission in 1st year? No. There is no such provision. Both exams are different. What is the minimum marks needed to qualify the 2nd year entrance exam in japanese language to study in jnu?? There is no minimum marks. The seat allotment will be purely based on candidate’s rank. Since number of seats are very less (single digit), Thus expect high cut-off. How many seats are there sir? That depends on the number of seats vacant in specific courses in 2nd year. Generally it is 10%-20%. So, maybe 5-8. Just a guess! Sir, I have completed my BA graduation, I have knowledge in Spanish language. I want to give the entrance exam for BA 2nd Yr in Spanish. Kindly guide me with the following process. As per the last 3 years Question papers (2017 – Link, 2016 – Link, 2015 – Link), my suggestion would be to concentrate on grammar, vocabulary, and paragraph writing. Invest in few good books, take help from any Spanish teacher (if required) and practice 3-4 hours daily. You have enough time i.e. 4 months. The question paper was equivalent to what we generally see Advanced Diploma exam. You can apply online from 15th September. Sir, this is Sandhya from AP. Pls tell me are providing diploma certified course in Hebrew language ? JNU doesn’t offer Diploma in Hebrew. However, Given India’s growing ties with Israel and high demand, last year JNU announced to start certificate and diploma courses in Hebrew. I will update if there is any news regarding that. sir i am b.com 3rd year student and get passed out in 2019. so i want to take admission in any of the one year language programme in jnu. please guide me further i will be thankful to you. JNU offers One-year Certificate of Proficiency (COP) only in not so popular languages like Bahasa Indonesia, Mongolian, and Pashto. If you’are interested in any of these 3 languages, you can apply when forms will be available. If your choice of languages are different, then you can either try private institutes or any other University next year. Sir I am handicap how many seat are reserved in jnu for Japanese language. 3% seats are reserved for Person with Disability. Thus, 1 out of 38 seats are reserved for PWD for BA (Hons.) in Japanese. Sir I’m from Rajasthan. I am doing B.Com 3rd year in Maharaja Ganga Singh University. Can I take admission in MA In Chinese language. No. Admission is through entrance test and to pass the exam, Knowledge equivalent to Advanced Chinese is required. It will take 2-3 years to reach that level of proficiency in Chinese. Hi Sir, I have completed BA this year and i want to take Korean language. Is it possible for me to give the entrance? I also want to know if any Student exchange programme for language and also when is the entrance for 2019 batch? You can give the the entrance test for BA (H) in Korean. Since you have already completed BA, it may not be wise to repeat bachelor degree again. MA in Korean is not possible for you since Knowledge equivalent to Advanced Diploma or TOPIK Level 4/5 is required to clear entrance exam. JNU do offer some student exchange programme during the course. Entrance exam will be held in December and forms will be available from next month. Sir since i’m thinking to give the entrance for korean language BA(H) 1st year. can you please give me some suggestions as to which topic i should stick more or concentrate on. For BA (Hons.) in Chinese, Korean and Japanese, There is a common written test. Syllabus is G.K., artificial language, short essays on issues related to the subject etc. You can check last 3 years question papers (Here). Buy few JNU entrance books and start preparing for it. Hello sir right now I’m doing MA 2nd year from IGNOU, I want to learn Korean. So can I apply for MA in korean language direct is it possible or I have to do BA. I did French certificate this year from SGTB KHALSA DU. Can you tell me how many Colleges are offering Diploma and can i take admission in session 2018-2019 in any DU colleges? Please Help. No special book. Buy few from online store and start practicing including previous year question papers. Sir, My son has been studying in Chinese honours in Banaras Hindu University in the 2nd year. He wants to admit in JNU in same Class. Is it possible? No. As far as i know, there is no provision to transfer from one university to another. The only possibility is to give entrance exam for 2nd year BA (Hons.) Chinese in December this year. If his Chinese is good, he can try. However, he has to repeat 2nd year again starting from July 2019. I cleared my B.sc in physics with 71% and want to take admission in jnu for studying foreign language course. so what have i to do for this? When to apply? Barring a few not so popular languages, JNU does not offer any part-time language courses. For MA entrance, Knowledge equivalent to Advanced Diploma or B2/N2/HSK V/ etc. is compulsory. So BA (Hons.) is the only option. Repeating the graduation degree course may not be the right thing to do. Think over it. Application form will be available next month. If you want to learn any language – There are many options in Delhi and other cities. So after completing BA (Hons), can’t we apply for a certificate course and then a PG diploma in a foreign language in JNU? JNU does not offer any Certificate or PG Diploma. For MA, a high proficiency in the same language is required. Generally, it takes 3 years to reach such level. Sir I am very desired to qualify the entrance examination in 2nd year in Japanese language. kindly tell me the procedure or the best way to prepare. I did 1 year course in Japanese language and I quit for my poor economic condition and now I want to take admission in 2nd year. please help me. Any special book which will help me because the questions in the previous years question papers are tough for me. There are many such books specially for Foreign language entrance exam. You can buy few as per description or review from any bookshop or online shopping sites. Hello sir I am a student of class XII so I wanted to know that when should I appear for an entrance examination. This year or next year, but if I try for it next year in September or whenever they provide for won’t I have to wait for a long time from June – September? Appearing candidates can also apply. Thus, you can appear for the exam this year in December, 2018. Forms will be available in September. All details will be here in advance. Sir please let us know some good and reliable source to prepare for jnu 1st year exam in foreign language after 12th. Is it possible to take all three languages from same cluster itself. Is it possible to take all three languages from all three different clusters respectively. I’m not sure about any private institutes for JNU entrance preparation. You can contact few in nearby areas. You can either opt for three languages from two clusters or all three languages from one cluster. Three languages from three clusters is not possible as per the last information. sir, can you tell me the the syllabus of 2nd year entrance exam for french language and also the procedure of getting into it. For 2nd year BA (Hons) in French, You need at least 45% in the first year of Bachelor’s degree or equivalent. Check – Syllabus for 2nd year French Entrance test and Check – 2017 QPaper , 2016 QPaper and 2015 QPaper Question paper will be in French. Adequate proficiency (something like Diploma or DELF A2/B1 or equivalent) is required. Application form will be available in September and Entrance exam will be held in December. Sir, I’m doing graduation from Du(sol) and want to learn Arabic language from JNU. What is the procedure of admission? Centre of Arabic and African Studies (CAAS) offers BA and MA in Arabic. JNU does not offer any part-time courses. Admission is through entrance exam. For BA – prior knowledge in Arabic is not required whereas for MA – Proficiency equivalent to Advanced Diploma is compulsory. Forms will be available in September. Sir, i have completed post graduation in economics, and waiting for the results. I would like to study foreign language in JNU, specifically Mphil in Japanese, course no: JP609 Research technique and methodology. When will be the entrance exam and how to apply for the same? JP609 is the part of MPhil in Japanese. I’m not sure if it is possible since you have done PG in economics and not Japanese. MA in Japanese or a degree equivalent to it is the prerequisite for MPhil Japanese program. Entrance Examination shall be conducted in Japanese only in the month of December. Sir I have completed my 12th this year. And I want to do Spanish language course from jnu. When the entrance exam date will come. Application form will be available in September and Entrance exam will be held in December. I will update in advance. Thank you for your appreciation. Wish you all the best for the future Deepakshi! Check – Syllabus for 1st year French Entrance test , 2017 Sample Paper for BA(H) French entrance test and Previous Year Question papers. I am doing diploma in spanish from Delhi University and I wanted to do Masters in Spanish from JNU. Is it possible ? Yes. Admission in MA in Spanish is through entrance test and Minimum eligibility criteria is graduation in any stream. However, Proficiency in Spanish (equivalent to Advanced Diploma or DELE B2) is required to clear entrance test (not certificate but knowledge). You can try in future once your Spanish will be good enough. Sir I am doing graduation from DU – SOL (Bcom hons) and I want to do language course from jnu. Pls give me the details. You’re interested in which course and language? Admission procedure will start in September. I will update all the information in advance. Sir what is this 45% marks under 10+2+3 pattern of education. How will my proficiency in the language will be judged and what’s the syllabus for second year entrance in chinese language? For 2nd year BA (Hons.) in Chinese, You need at least 45% in the first year of Bachelor’s degree or equivalent. Check – Syllabus for 2nd year Chinese Entrance test and 2017 Sample Paper for BA(H) 2nd year Chinese. Question paper for the entrance test will be in Chinese. Adequate proficiency (something like Diploma or HSK Level 2/3 or equivalent) is required. Is there any book which provides the guidance to qualify in jnu 2nd year entrance examination of Japanese language? Not that i’m aware of. It would be better to join any Japanese institute. It would be difficult to learn Intermediate level Japanese without any teacher. What is the syllabus of jnu 2nd year entrance examination in Japanese language? Check – Syllabus for 2nd year Exam and 2017 Sample Paper for BA(H) 2nd year Japanese. Question paper for the entrance test will be in Japanese. Adequate proficiency (something like Diploma or JLPT N4) is required. Other than DU and JNU, There are several Universities like Jamia, EFLU, Mumbai University, Pune University, IGNOU, Kolkata University, just to name a few. However, it will be difficult to get admission this year as admission process ends by May-July & Classes starts in August. Try next year. Sir, This year I completed my 12th. Now I want to do foreign language from French. When the application forms will come? For Session 2019 onwards, JNU admission form will be released in September 2018.
when the entrance exams will held? Entrance exam is going to be conducted in December or January. I will update all the details in advance. I completed my 12th this year but I got to know about the foreign language course later and the registration dates of many colleges have over so can I apply this next year means, Is there any age limit? And are there some DU colleges who provides admissions in language course on entrance basis? If there are so please tell me all colleges name. Unfortunately, JNU or most of the top-ranked university have limited intake and that includes 50% reservation quota. For past several years, number of seats are more or less same. If you want to study at JNU, you need to prepare quite well for entrance exam. Don’t worry JNU is not the only option to learn foreign languages. I made my career in the field of Foreign Languages without studying at JNU or any top-ranked University. At the end, Knowledge and Experience matters! Can I do french language course from JNU if I’m doing English hons from du right now. I’ve just completed 10+2 and taken admission in du for english hons. Can I do french course too along side? I am graduated in F&LA from NiFT in year 2011, right now I am 28 years old and want to learn french. Is there any age limit to take the course, if not them how to apply for the course and what is a fee structure. Which course are you looking for? JNU doesn’t offer any short-term French course. Admission in MA is through entrance exam and knowledge of Advanced French is compulsory. There is no age limit for any master degree. If you’re looking for some professional French courses, then there are number of options with no age limit. At what location you want to study? JNU offers BA (Hons.) in French through all India entrance exam. The university don’t offer any short-term / part-time french course. Admission process will begin in September-October for 2019-2022 session. When your form will be distributed for the course of BA (HONS) FOREIGN LANGUAGE , kindly give me information of the same. Admission process will begin in September-October for 2019-2022 session. Sir I’m post graduated & Somhow I learned Spanish by my own but now i really want to enroll in Diploma /certificate courses..And the Major hurdle is that i am living a remote area in Uttarakhand..What to do please guide me.. I’m clueless. There are 2 options for you. 1) Shift to nearby city like Dehradun or Delhi/NCR to pursue Spanish course. 2) You can enroll in IGNOU’s fully online programme, Certificate in Spanish Language (CSL). Read – Foreign language courses in IGNOU. We are also planning to start our Online Spanish course soon. I’m graduated this year in English (honrs). My age is 21. Am I applicable for the B.A. honors in Japanese? Yes but Why you want to pursue graduation again ? You can study Japanese from any private institute or Japanese embassy affiliated centre and prepare for JLPT (Japanese language proficiency Test). What type of questions can come in the entrance exam of Japanese language for B.A. honrs course? All the details including link to sample paper is mentioned in the heading – The Entrance Examinations for B.A.(Hons.) 1st year. What is the exact fees required in B.A honrs in Japanese language for 3years full time course? Since JNU is fully funded by the central government. Thus, Fees is very nominal. Just few hundred Rupees. However, due to limited seats and large number of applicants, getting admission is not easy. Check – JNU Fees. I want to do honrs in Japanese language.What is the criteria for the entrance examination,and in which month the examination will be held? Admission process starts in September-October with Online application form. Entrance exam – January, Declaration of written exam – Feb, Viva-Voce test and Final result in March-April. Language part time course k liye admissions kab honge. JNU offers part-time Certificate in Pashto, Mongolian, Bahasa Indonesia and Urdu. 10+2 is required and you can contact JNU admission department. These languages are not popular and offer limited career and job opportunities. For Degree level courses, Admission process starts in September-October for next academic session. You can apply in September this year if you are interested. It is better to opt for part-time courses in important languages like French, Spanish, German, Japanese, Chinese, Korean, etc. and for that try D.U. or Jamia Millia Islamia or any private/embassy affiliated centre in Delhi. I want to do language course in your centre.